Worthy of note: these aspects are part of the large Grand Water Trine this summer. We note that the New Moon of February 10th started the Chinese Year of the Black Water Snake. While interpretations vary, some describe anything to do with the Black Water Snake as being associated with disaster. “Deeva” at “Mystic Chix” grabs a copy of this chart and publishes essentially the ideas stated here for their own use in a blog that supports a commercial venture, without permission, and asserting copyright. For more details, click here. I note that they chose to do that during this time. We like this commentary on the upcoming Grand Water Trine this summer. A series of remarkable alignments happen this year. We think that the peak moment for the energy of these alignments is shown in this next chart, noting that we question the idea of any particular single “point” as being the most important, particularly in a series of large scale alignment such as the family that contains this one. The exact aspect in this chart is Moon Trine Jupiter, but we picked it because it is within 24 hours of Jupiter Trine Neptune, which only occurs once in this series. 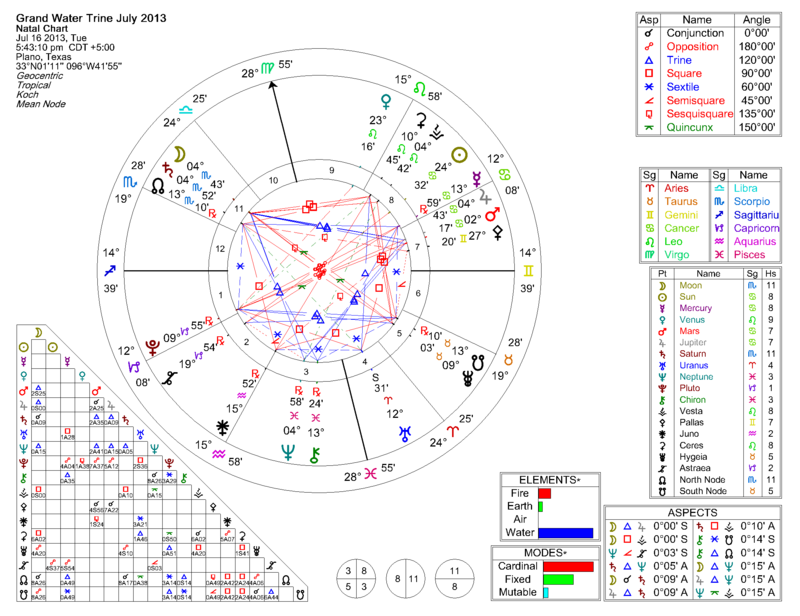 Here is the U.S. Map for this chart (Moon Trine Jupiter). 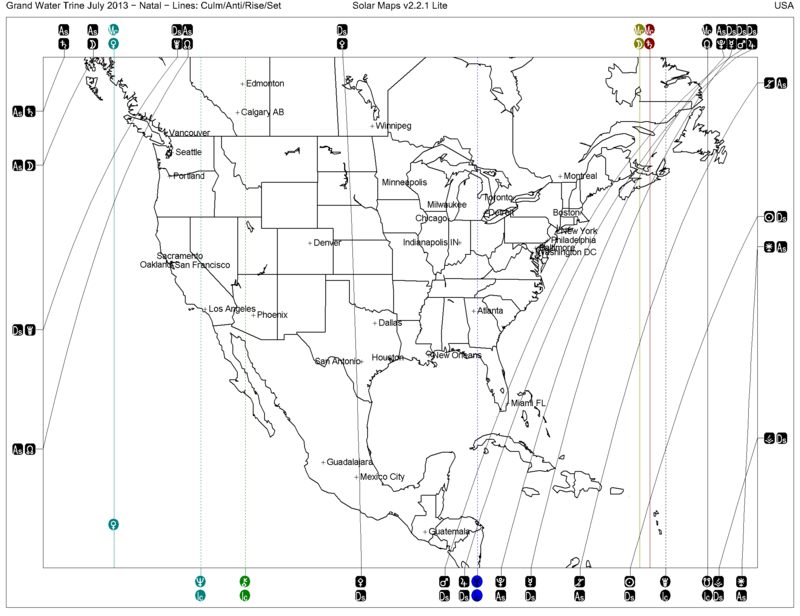 We note a Venus line through the center of the U.S. It passes near San Antonio and, further south, Mexico City. Other lines that touch the continental U.S. include the Mars line near Miami, the Chiron line through Idaho, Utah, & Arizona, and the Neptune (IC) line through Los Angeles. I see that I am already getting traffic looking for information about the Grand Water Trine (or Grand Trine in Water) in July of 2013. It is probably the most important pattern of 2013, and it heralds important opportunities for change. It is exact on July 17, 2013. And, in the months to come, I will update this post (and likely add other posts referring to it). The configuration involves Jupiter in Cancer, Saturn in Scorpio, and Neptune in Pluto. I expect a world leader of major importance to be born (or possibly “show” themselves) this year. Click here for the Saturn Trine Neptune Charts.